Hanumanasana, also known as Monkey Pose, feels different each time I do it. There are days when I can get my pelvis to the floor with my hips square. But these days I focus more on getting the benefits of the pose instead of going all the way into the pose. There’s a distinct difference between these two approaches. If I’m going for the full pose, I’m more likely to push myself aggressively. I might ignore my quirky left hamstring that sometimes spasms from a decade old injury. I might overarch my lower back because I’m bypassing the tightness in my back hip. Doing those things (and getting my pelvis to the floor) doesn’t make me adept. It just means I’m grasping for something that ultimately causes suffering – in the form of back or hamstring pain the next day! This isn’t really the attitude I want to bring to mat – I’d rather use my time there to let go of pressure, to experiment, and to be grateful for what I have. This is where the real work is for me. So. Instead of pushing, I try to focus more on asking my body what’s going to work on that particular day. Is it going to work better if I hold Half Hanuman for a long 10 breaths as I work up into the pose? Or is it going to feel amazing if I just let myself hang out on top of a bolster and work on stretching my back hip? The truth is, it’s natural to want to take a “final” form of a posture. But, if you can check your ego a bit and ask your body what it needs, you will learn so much more about yourself. You’ll learn to respond to your own needs with honesty and resourcefulness. And when you’re true to yourself and your needs on the mat, you’re building a foundation for being true to yourself and your needs in your life. 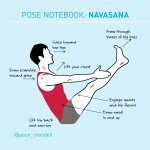 These are a few of our favorite poses leading to Hanumanasana. 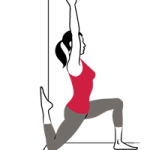 You can use the first four poses as warm-ups for Hanumanasana, or you can substitute Hanumanasana with any of these variations when you take a class. 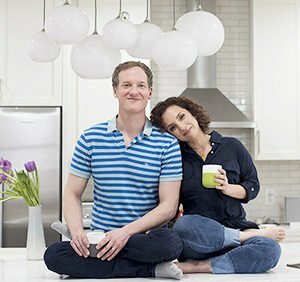 If you’re going to take the former route, I recommend doing poses 1-15 of Jason’s Hanumanasana sequence and then moving into these variations. Let us know how it goes! Draw your hips back as you straighten your front leg. Flex through the front foot and come forward as far as is appropriate for you. Stay for several breaths, feeling into your hamstrings and IT bands. To come out, bend your front knee and come back into the lunge. Then step back to Down Dog and do the other side. This one is sooooo good. Grab your bolster and place it next to your mat. If you’re on the tighter side, grab two blocks as well. Come back into the Low Lunge and place the bolster under the top of your back thigh. Put your blocks under your hands for support if you need them. From there, lower your left sitting bone onto the bolster and begin to straighten your front leg. Don’t worry about getting it completely straight. What’s more important is to work on two actions: The first is to square your hips, so that both hip points are facing forward. The second is to resist a forward tilt (anterior tilt) in your pelvis, which leads to compressing and overarching your lower back. 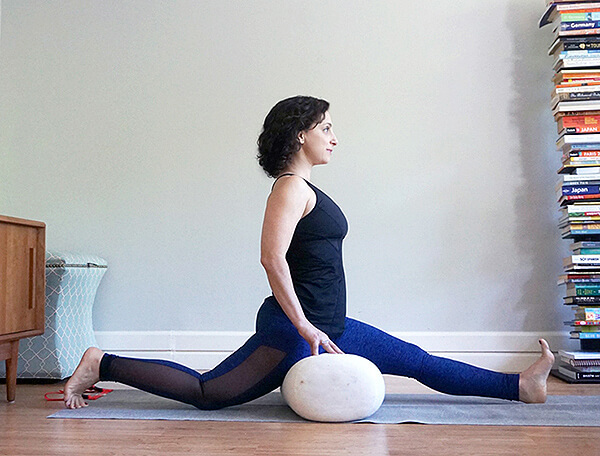 You have to really engage your leg muscles to get these actions — no sinking into the bolster! Press down into your front heel and draw your front hip back. At the same time, tuck your back toes under, press down into the floor, draw the back hip forward. Hug your inner thighs in toward the midline and notice how this creates room for you to draw your tailbone down (resisting the anterior tilt) and lift your spine up! Start in the Low Lunge once again. This time, you place a block just underneath your front sitting bone. Repeat the actions that you did above: Engage your leg muscles. Press your feet into the earth and hug your legs in toward the midline to make space for your pelvis to come into a neutral position. Breathe into the spaces that need it. Then release, and do the second side. ** Please note that I switched legs in this photograph so that you could see the pose better! I am going to instruct it according to the way it looks in the photo. This one is tricky to get into and requires some experimenting. Start in a shortened Down Dog — hands and feet closer to each other than normal — with your feet about a foot away from the wall. Place your left leg up on the wall, toes tucked under. 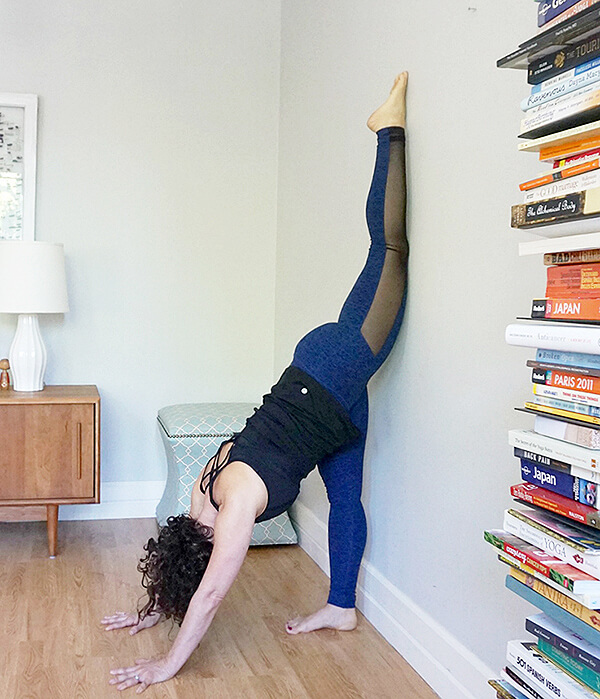 Now, check in with yourself — do you need more of a stretch? If so, walk your hands toward your foot and hop your standing foot closer to the wall. 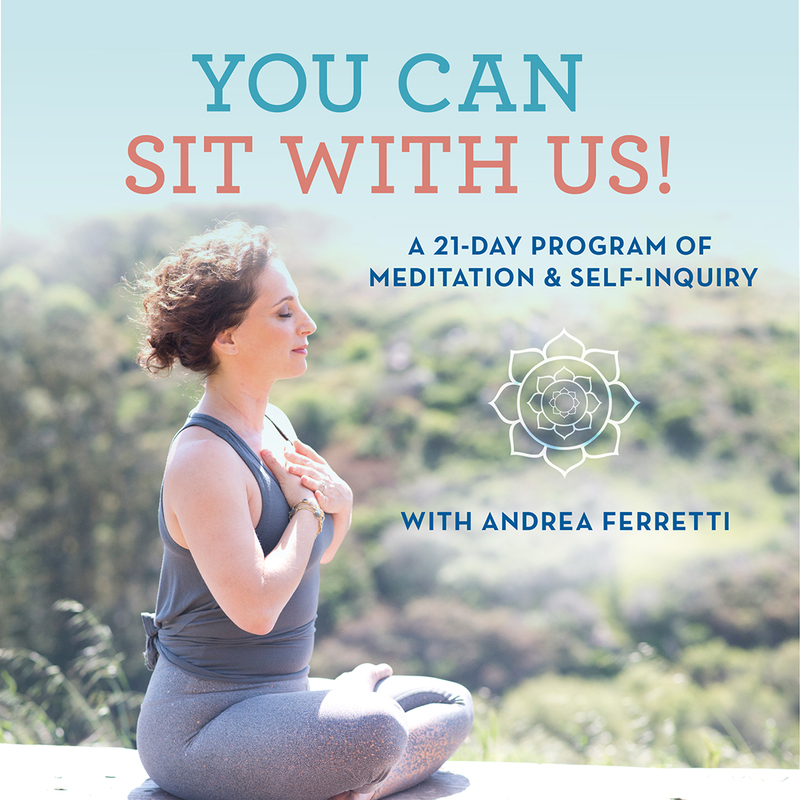 Continue to check in and figure out if your body wants to go deeper, all the while keeping up the actions of the pelvis and legs that you did in the earlier postures. Once you feel like you’ve found a good place to stay, you can come to the top of the back foot. Come out of the pose slowly by walking your hands forward and hopping away from the wall. Before I instruct this pose, a quick disclaimer: I have been doing this pose since I was a gymnast at age 6. It’s always been basically within my reach, even in the years when I was chained to my desk and didn’t do as much yoga. I’m saying this because we rarely openly acknowledge in yoga that some poses come easily to some people — and some poses might never feel great in our bodies. I don’t think I will ever feel great in a deep backbend. I’m OK with that now. And I can still work the preparatory poses to take me through my range of motion and keep me agile in my daily life. That’s the goal isn’t it? To feel our best? OK, my lecture is done. If the previous poses felt GREAT, then come into Half Hanumanasana (Half Monkey Pose) and slide your left leg forward. With your back toes tucked under, draw your back hip forward. Hug your inner legs together. When you keep your legs engaged, your pelvis might not touch the floor (notice mine doesn’t here). That’s perfectly OK.
On particular day I was not feeling open enough to lift my arms skyward into that crazy-beautiful-deep expression of Hanumanasana. That’s the truth! If you are feeling gloriously open and you want to reach your arms up, go for it. It feels amazing and playful. To come out of the pose, place your hands on the floor and lift your pelvis so that you come back to Half Hanuman and Downward Dog. Try the other side. Notice the differences. Thank yourself for practicing and being present today. Take a Break and Do Some Yoga! Right Now. You’re Welcome. I take pride in being a yoga teacher who prioritizes the benefits of mindfulness, alignment, and having great posture where we live and work. But if you saw me working at my desk, you might catch me mindlessly slouched forward over my laptop looking tight and stressed. Do you jut your chin forward, shrug your shoulders, and round your back like I do? OK, phew! I think we all do. How does working at your desk with poor posture make you feel? Drained, tense, creatively and energetically closed off? Me too. It’s also been well-documented that sitting for long periods of time is damaging for your health. Stand-up work stations are becoming more popular — but standing all day isn’t considered optimal either. The two best things you can do: 1) Vary your posture (from sitting to standing to walking) throughout the day and 2) take breaks often. The yoga sequence below will lengthen your spine, open your chest, stretch your shoulders, and soothe neck tension. With the exception of the twist, you can do all of the poses standing or even walking around — maybe your co-workers will think you’re crazy. Or maybe they’ll join you! Before you begin, breathe deeply and notice how you feel. Hold each pose for a comfortable 3-5 breaths and when you’ve finished, pause again and notice how a little yoga has transformed how you feel. Stand or sit at the front edge of your chair with your feet hip width apart on the floor. Interlace your hands and flip the palms up as your stretch your arms up and overhead. Stand or sit at the front edge of your chair with your feet hip width apart on the floor. Hook your pinky fingers behind your back with your palms facing forward. Stretch your arms back to open your chest and shoulders. Sit at the front edge of your chair with your feet hip width apart on the floor. Twist to the right and place your left elbow against your right thigh. Bring your hands to prayer and as you lengthen your spine and twist your spine. Repeat on the left side. Turn your back toward your desk and stand with your feet hip width apart. Next, turn your arms out so your fingers face the sides and set your hands on the desk shoulder width apart. Walk forward until you can lift your chest up and back into a comfortable and stretchy backbend. Sit at the front edge of your chair (or stand) with your feet hip width apart on the floor. Place your right hand on the left side of your head and fold your head over to the right. Reach your left hand away from you with your palm facing down. Repeat on the other side.